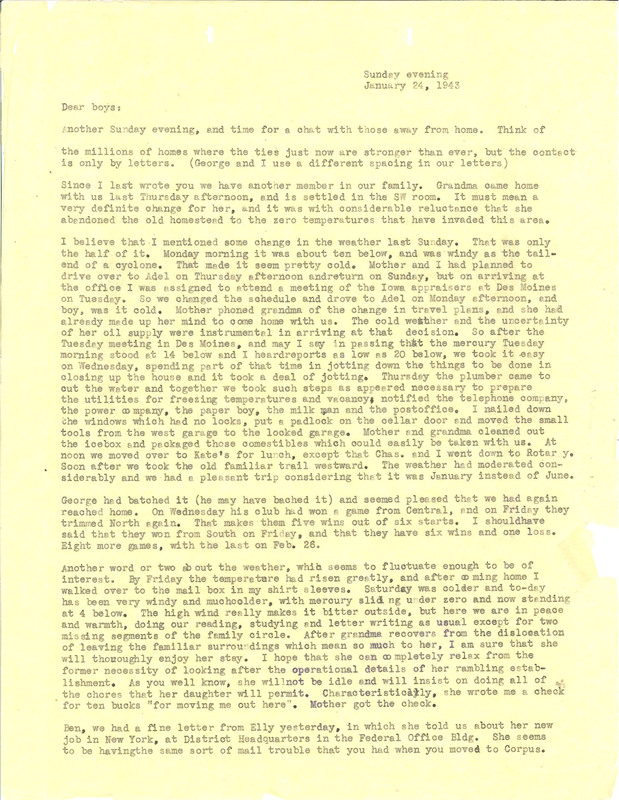 Sunday evening January 24, 1943 Dear boys: Another Sunday evening, and time for a chat with those away from home. Think of the millions of homes where the ties just now are stronger than ever, but the contact is only by letters. (George and I use a different spacing in our letters) Since I last wrote you we have another member in our family. Grandma came home with us last Thursday afternoon, and is settled in the SW room. It must mean a very definite change for her, and it was with considerable reluctance that she abandoned the old homestead to the zero temperatures that have invaded this area. I believe that I mentioned some change in the weather last Sunday. That was only the half of it. Monday morning it was about ten below, and was windy as the tailend of a cyclone. That made it seem pretty cold. Mother and I had planned to drive over to Adel on Thursday afternoon andreturn on Sunday, but on arriving at the office I was assigned to attend a meeting of the Iowa appraisers at Des Moines on Tuesday. So we changed the schedule and drove to Adel on Monday afternoon, and boy, was it cold. Mother phoned grandma of the change in travel plans, and she had already made up her mind to come home with us. The cold weather and the uncertainty of her oil supply were instrumental in arriving at that decision. So after the Tuesday meeting in Des Moines, and may I say in passing that the mercury Tuesday morning stood at 14 below and I heardreports as low as 20 below, we took it easy on Wednesday, spending part of that time in jotting down the things to be done in closing up the house and it took a deal of jotting. Thursday the plumber came to cut the water and together we took such steps as appeared necessary to prepare the utilities for freezing temperatures and vacancy, notified the telephone company, the power company, the paper boy, the milk man and the postoffice. I nailed down the windows which had no locks, put a padlock on the cellar door and moved the small tools from the west garage to the locked garage. Mother and grandma cleaned out the icebox and packaged those comestibles which could easily be taken with us. At noon we moved over to Kate's for lunch, except that Chas. and I went down to Rotar y. Soon after we took the old familiar trail westward. The weather had moderated considerably and we had a pleasant trip considering that it was January instead of June. George had batched it (he may have bached it) and seemed pleased that we had again reached home. On Wednesday his club had won a game from Central, and on Friday they trimmed North again. That makes them five wins out of six starts. I shouldhave said that they won from South on Friday, and that they have six wins and one loss. Eight more games, with the last on Feb. 26. Another word or two ab out the weather, which seems to fluctuate enough to be of interest. By Friday the temperature had risen greatly, and after coming home I walked over to the mail box in my shirt sleeves. Saturday was colder and to-day has been very windy and muchcolder, with mercury slid ng under zero and now standing at 4 below. The high wind really makes it bitter outside, but here we are in peace and warmth, doing our reading, studying and letter writing as usual except for two missing segments of the family circle. After grandma recovers from the dislocation of leaving the familiar surroundings which mean so much to her, I am sure that she will thoroughly enjoy her stay. I hope that she can completely relax from the former necessity of looking after the operational details of her rambling establishment. As you well know, she willnot be idle end will insist on doing all of the chores that her daughter will permit. Characteristically, she wrote me a check for ten bucks "for moving me out here". Mother got the check. Ben, we had a fine letter from Elly yesterday, in which she told us about her new job in New York, at District Headquarters in the Federal Office Bldg. She seems to be havingthe same sort of mail trouble that you had when you moved to Corpus.